Geraldine, or Geri as she is known, might not strike you as the type of person who has struggled with confidence. The 80-year-old hair salon owner from Bethel radiates an infectious energy that most women half her age would envy. But several years ago, a bout of cancer and a drawn-out recovery period left Geri feeling physically exhausted and mentally defeated. The treatment had taken its toll on her appearance and she didn’t recognize the person who stared back at her in the mirror. 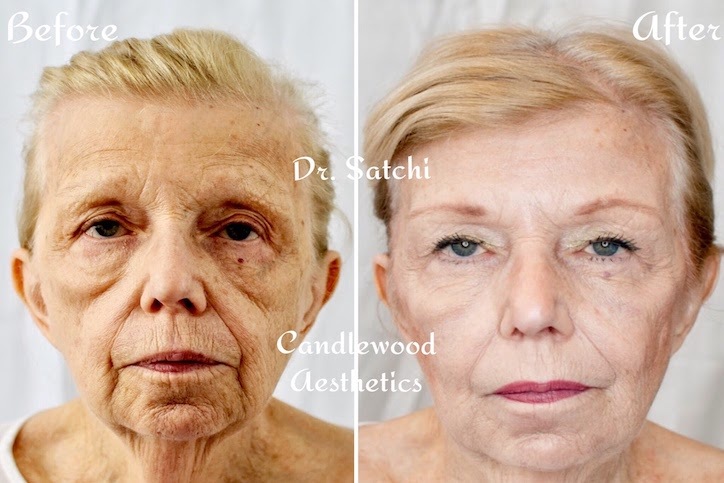 We spoke to Geri about her decision to enlist Dr. Satchi and Candlewood Aesthetics to help her feel like herself again. Geri, what made you want to seek out cosmetic enhancement? My illness took a lot from me. I was so grateful to be handed a clean bill of health but I was also devastated by how the treatment had aged my face and exhausted my features. Being in the business of beauty, I have a certain standard for myself and for my clients. It’s really important for me to look professional and to feel confident since the people who sit in my chair are trusting me to help them look amazing. I wanted to be able to look and feel like I did before I got sick, which is why I turned to Dr. Satchi. I had deep-set wrinkles and fine lines around my eyes and forehead as well as crows feet and bunny lines. Dr. Satchi was able to smooth them with Botox which surprisingly took just a few minutes. I also had several fillers to enhance and define my lips, rebuild my facial structure and fill in deep lines around my mouth. Because of the cancer treatment, my cheeks had sunken in, so Dr. Satchi filled them to make my face look more defined and healthy. It sounds like a lot but the results were so natural. I felt like ME again! Clients kept asking me what new products I was using and I told them all about my experience with Dr. Satchi. I was so proud of the results. Cosmetic enhancement is often stigmatized and can be viewed negatively. What are your thoughts on this? My experience has never been that way but I think it’s a personal choice. Perception can really hurt people and I’ve always thought that if you look your best, you’ll feel your best and you’ll perform your best. I was very confident with Dr. Satchi and I am happy telling people about the treatments that I have received. Everyone deserves to be their best selves, whether that’s going to the gym, eating well, practicing meditation, or another lifestyle choice. If a face or body enhancement will make you feel great, go out and do it! If it’s not for you, then that’s ok too. How have the treatments you received from Dr. Satchi changed your life on a daily basis? I am more confident in myself because I am happy with the way that I look. The person after my cancer treatment wasn’t me. This is me. Being in doctor’s offices when I was sick was scary but this experience was the complete opposite. I felt so comforted and I knew that I was going to be cared for. Dr. Satchi wants all of his clients to be their best selves and that really resonated with me because that’s how I feel when I work with my clients at the salon. His artistry transformed my life - not just physically but mentally, which to me is more important than anything else. In this blog, we explore how cosmetic enhancement has both a physical and mental impact on the lives of women and men. All stories are real-life accounts from Candlewood Aesthetics patients. To read more, visit our main blog page or sign up below to receive our email newsletters.